Vintage style garden decor makes my heart go pitter-patter. Which is a good thing, because you really don’t want your heart to NOT go pitter-patter. Because then someone really should be calling the paramedics for you! But on a non-heart attack related note, occasionally while trotting around at an estate sale I run across some cool old gardening stuff. And of course I buy it. Because I LOVE it. 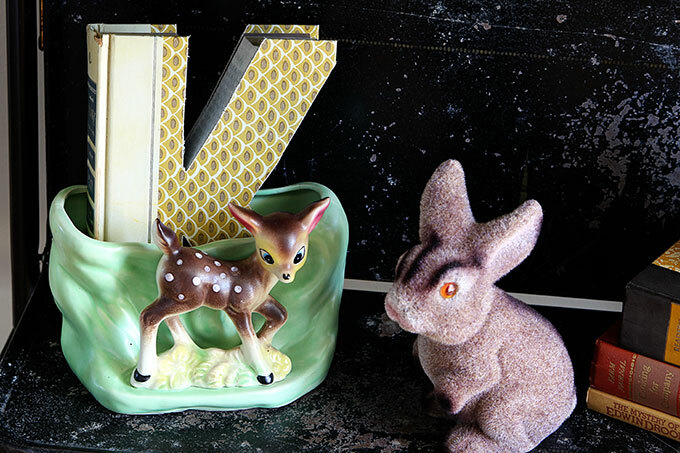 And then I relax, because I remember that I can make a cute springtime vignette with them! 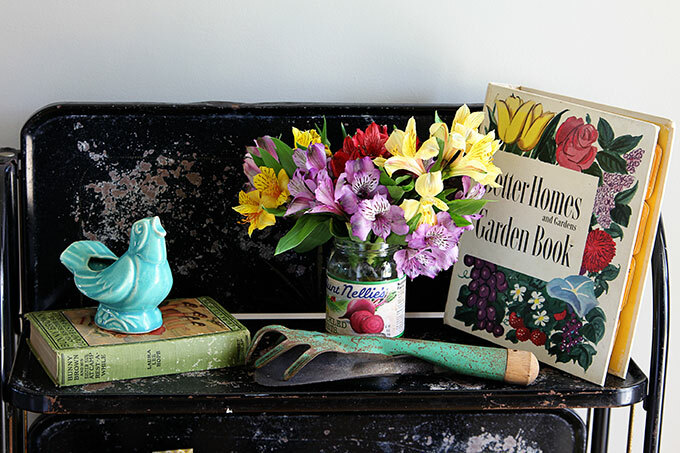 I call this my Vintage Eclectic Spring Gardening Style Vignette. 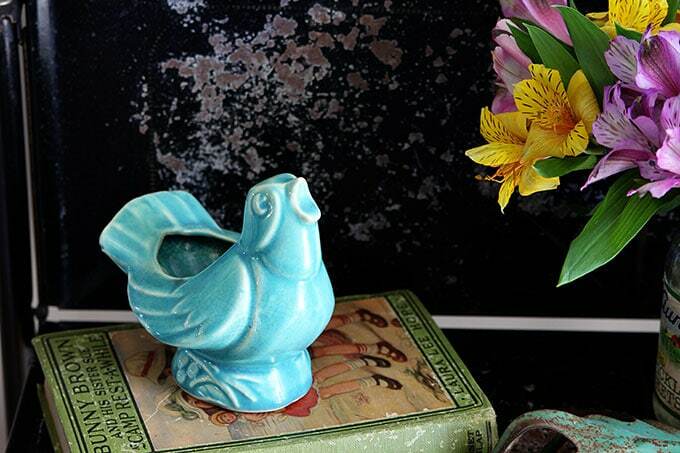 My McCoy blue bird planter always comes out to play in the spring. I picked him up at a yard sale a few years ago for a buck. See that jar with the flowers in it? Yeah, that’s a beet jar that I kept from Thanksgiving dinner and just knew that I would have a use for it. I gave it an aged patina with a little watered down brown craft paint and voila . . . it’s a cute garden themed vase! The Better Homes and Gardens Garden Book was found at an estate sale, I believe. He or she (no antlers means a girl?) is not marked, but it has that matte finish like a lot of the McCoy pieces. So until someone tells me otherwise, I’m calling it a real McCoy. I thought my beehive measuring cups that I found at an estate sale not too long ago (dang it!) would fit nicely in with the theme. 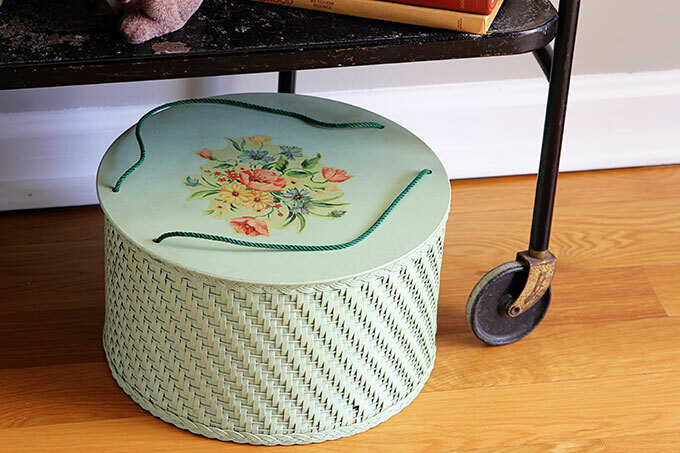 Even though this is a sewing box and I’m not actually doing a sewing vignette, I thought it would be appropriate because of the flowers and springy color. This may or may not have been found at an estate sale, but since I’m not talking about that I won’t bother to type it out for you. Now I’m off to fish some more jars and cans out of the trash to see what I can make with them. Have a wonderful spring filled day! Perfection! 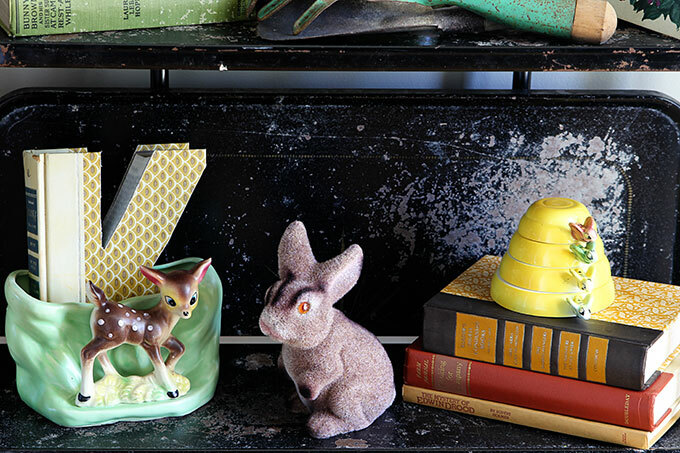 I have one of those little birds in yellow…and that deer!! Very sweet. I actually bought that at a local shop, but it was just cut with a saw 🙂 They had all sorts of letters cut out of the books. BTW, I also saw them at the Country Living Fair for something like $25 (way, way more than I paid) and all I could think of how easy it would be to do yourself! You can find Readers Digests at the thrift stores for under a dollar and then just figure out what kind of saw you use (bandsaw maybe?). Thank you. Another project for me to try! Off to the thrift store, and I’ll put it in my scroll saw and see what happens. Love your style! I love everything about this display, Pam…whimsical and charming! So cute. Love that deer planter. The whole vignette is too cute. Pam, I bought that same sewing basket at an estate sale except mine is pink. It was only $10 and was full of vintage sewing notions — lot of buttons, rick-rack, pins. My favorite things from inside were some small, decorative “stork” scissors and some very old metal bobbins about 1.5″ tall. Sounds like you lucked out! Mine came with one needle in it and I only found that because I stuck myself with it when I was wiping out the interior! Love your display. So springy and colorful. I have that same sewing box. It belonged to my grandmother. I found one on Etsy and bought it for my daughter. Thank you for sharing and Have a Fabulous Day! Everything looks wonderful. Love the vignettes. I’ll have to save my next jar of Nellies beets the next time I get some. 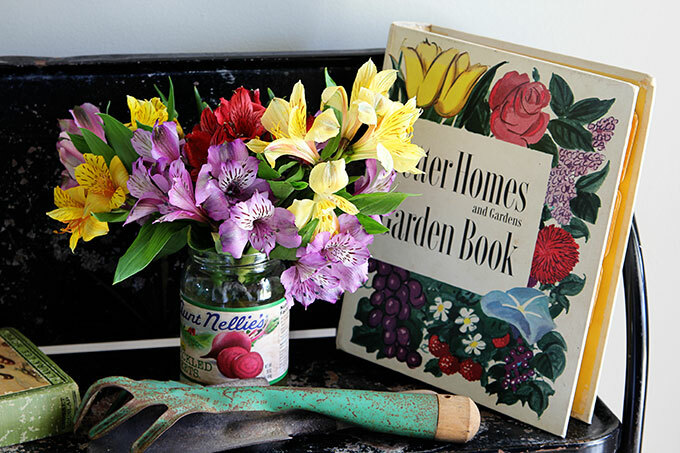 Your Vintage Eclectic Spring Gardening Vignette is picture perfect. Love all the elements. They work well together. I’m particularly fond of the bird, deer and bunny. Very cool. I must pay more attention to packaging at the grocery store. I can’t say I’ve ever seen a beet jar before. Great way to use the jar! Y’know, they can those beets right here in my neck of the woods, in a teeny-tiny little burg where that business is pretty much the main gig. I’m sure the folks at Aunt Nellie’s would be tickled to see their jar featured in your vignette. I’m loving it, especially the McCoy(s). You need to do a tutorial on your jars. I demand it! We bloggers must know how to recreate that cuteness. If any of your lovely gardening-spring themed treasures end up missing, you might want to check my Grand Rapids garden shed. I’m looking forward to do some spring cleaning and finding some more things to hang on my walls. I love this vignette so much! 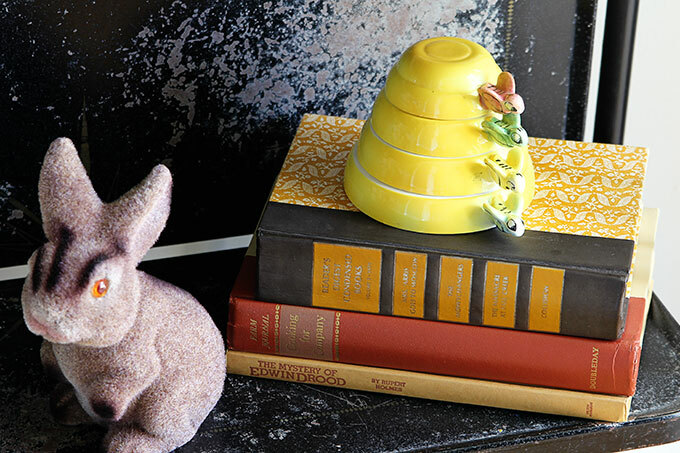 Love your spring vignette. 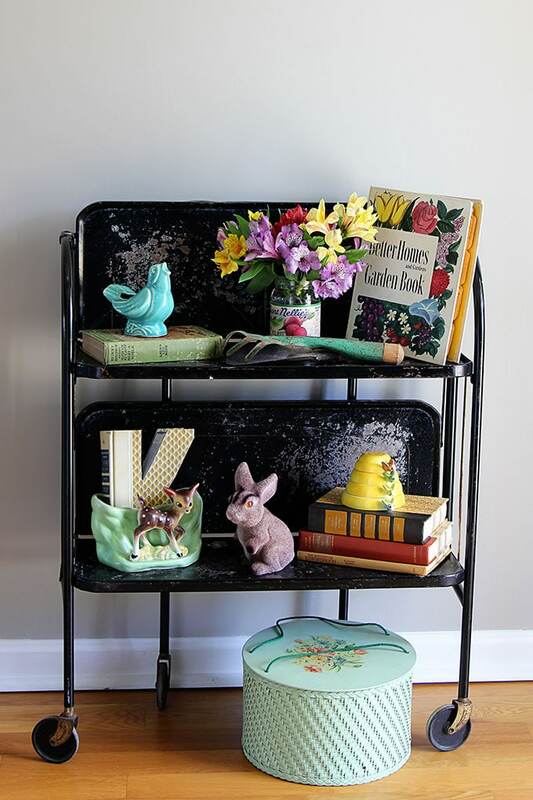 I can never pass up a vintage garden item, tools, books, flower frogs, seed boxes you name it! That is why I had to build a little garden cottage in my backyard ..just for my garden antiques. you put it all together. Happy Spring! You are the blogger whose style is exactly what I like! I love this display. I have that exact BHG book (found in a dumpster). I’m going to get it out and putt it on my porch. My brother and I had rabbits just like yours that were in our Easter basket one year. 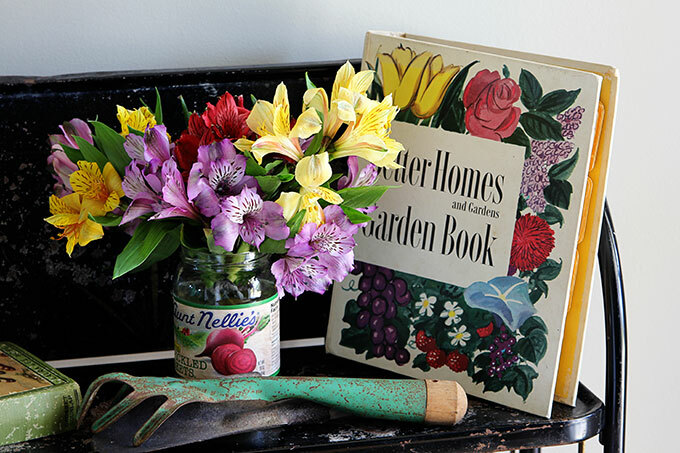 Your garden vignette is lovely. That black roller cart is the coolest! Awesome! Thank you so much for sharing. I really liked your ideas for garden decor. Your ideas are really very unique and attractive. I really liked your Ideas for vintage style garden decor, I was really not aware of such designs ever. Thank you so much once again for sharing such unique ideas with us. Keep Posting.